Ken Ilgunas: The making of "This Land Is Our Land"
The making of "This Land Is Our Land"
So I recently finished my third book, This Land Is Our Land, to be published in the spring of 2018 by Dutton, a Penguin Random House imprint. The book proposes something many will consider radical: opening up private land for public recreation. 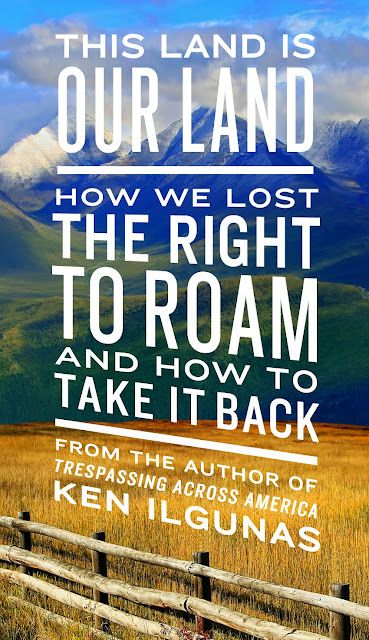 I have much to say about the “right to roam,” but I’d like to use this space to talk about how the book came to be. The idea for the book came about during a dinner table conversation at my friend David’s home in North Carolina. I was living elsewhere at the time, but I was driving through North Carolina on my Trespassing across America book tour. Either I was talking about the recent Scottish law that opened up private land, or I was moaning about all the No Trespassing signs in North Carolina. I don’t know how it started, but I’m sure I at one point said something like, “Roaming ought to be considered a natural right!” David, seeing that I had more than a bit of passion for and knowledge of the subject, suggested I write a book about it. Recognizing that I had this topic more or less to myself (in the U.S., at least) and reminding myself that I’d already done a great deal of research, I figured I could pump out a 20,000-word treatise that could be an e-book accompaniment to the paperback version of Trespassing across America. It would ultimately be an extension of my New York Times Op-Ed, “This Is Our Country. Let’s Walk It.” That one NYT article gave me the standing to write the book, and the reaction it got (many hundreds of reader comments) made me think this subject needed expanding. Once my book tour was over, I went to work, crafting up a book proposal and planning chapters. Soon, I got the okay from my agent, my editor, and my publisher, and I had my third book contract and a $20,000 book advance. Over the next few months, though, I began to see that the topic was too big for a 20,000-word book. I felt like the book should not just propose a radical idea, but that it should describe how land is being seized from the public, and how we’ve for decades been losing our green spaces to either development or private landowners. The book should go deep into American history: It should chart how our present understanding of private property came to be. Moreover, the book should go deep into human history: It should describe how different cultures and different peoples understood property differently, from our hunter-gatherer past to urban-suburban present. In time, 20,000 words would grow to 70,000. Six months turned to twelve. An e-book accompaniment turned into a legitimate paperback book. And, finally, I’d have to deal with the mess of 575 footnotes. This was exciting: I had the subject all to myself. But it was also discouraging: I wasn’t sure if there would be an audience for the book. Being the author of a book that proposes something nobody else is advocating can be lonely, even a little scary. Will I be ridiculed by critics? Will I be attacked by the Twitterverse? Or, worst of all, will I be completely written off and ignored--an author’s worst fear? But one ought not write a book that has nothing new to say, and mine certainly has plenty to say. And as scary as the book was, it was exciting: I’d get to be a sort of “thought pioneer,” even if a lot of my thinking draws from current countries and centuries-old history. My work, though, began to feel particularly pointless when, halfway through, Trump got elected. The whole country seemed to be sliding into the Dark Ages and here I was, talking about something as terribly important as… walking rights? The election took the wind out of my sails, but I sailed on when I began to think about the book not as a book for the twenty-first century, but as a book for the twenty-second. It’s critical we work to fix the concerns of the present (no one would argue that), but I also think it’s necessary for a few of us to set aside the immediate now to think about the possibilities of the deep future. I’ll be the first to admit that we have graver problems than our problems of nature-deficit disorders and recreational access. Racial inequality, environmental justice, prison reform, climate change, a broken political system are issues more serious and more pressing. So, at times, I’d feel guilty for focusing on something so un-immediate and faraway. It was like I was planning for a far-fetched future while the rest of the country was hard at work, focused on fixing the difficult problems of today. But the truth is that the difficult problems of the present already have their champions--champions with greater expertise and greater passion for their subjects. The right to roam, though, was practically my own. That’s not to say that I care about the right to roam more than anything else. That’s not the case at all. I care about climate change, wealth inequality, and a number of subjects more. But those subjects have their share of experts, whereas the subject of roaming only had me. I remember listening to a Tim Ferriss podcast interview with co-founder of Wired, Kevin Kelly. Kelly said that he has had tons of ideas for books, but that he tries to give those ideas away. He only writes a book when he knows he’s the only person who can write it. And I suppose I felt this way about This Land Is Our Land, that I was the only person who could write it. Why? Firstly, it’s emotional: I have always been unusually irked by unnecessary "No Trespassing" signs. The idea that someone could selfishly close off access to land for one’s exclusive use has always seemed plainly unjust. Let’s say I’ve always been predisposed to an open roaming culture. Secondly, I literally trespassed across America when following the Keystone XL, an experience that gave me a one-of-a-kind perspective on private land and what natural glories lie behind all our fences and barbed wires. Thirdly, from my research, I'd been acquainted with the roaming laws of Scotland, Sweden, and England. Knowing that these systems not only existed, but worked, made the idea seem less fantastical and more possible. It made me think that it’s something we should discuss, whether in this century or the next. Looking back, I see a book crammed with research and interviews and I ask myself how I did it in the space of a year. But this is how it works: one question leads to another question, which leads to another and another. Once you’ve answered all your questions with research, you’re done. This book was propelled by curiosity. Every enthusiastic researcher, I think, has a bit of the explorer in him, because to him the uncovering of a long-hidden fact, or quote, or idea may be just as exhilarating as cracking open a chest of buried treasure. But it was also propelled by something else, something close to heresy. There is something exciting (dangerous, even) about saying what has yet to be said, about trying to make a country think critically about itself, about being the first to stick your neck out there. In ways, I welcome (even desire) the criticism, the malice, the ire, as any true heretic might. I mentioned before how I thought the right to roam was somehow irrelevant to our present times, but after researching the subject I began to see that many of our present-day issues are tied to how we use and own land. We see the same sort of inequality in land ownership that we see in wealth. We see racial groups underrepresented in their ownership of land and their access to green spaces. We see an isolated Bowling Alone society, cut off from one another and scared of everything. We see growing obesity in adults and kids. We see an America that is blind to the ecological atrocities committed on private farm land. We see forces that want to privatize the public, exploit the sacred, and favor individual liberty over the common good. And so my book went from the twenty-first century, to the twenty-second, and came back again to the twenty-first, oddly relevant in the age of Trump. It remains to be seen how the book will land when it comes out in 2018, when our backwards-looking president and Republican-led Congress will likely still be in power. Readers may very well be too fixated on the slow-motion train wreck we all can’t look away from, or just maybe we’ll all be itching for something new. In the grand scheme of things that need fixing right now, this seems pretty insignificant compared to universal healthcare, better public schools, gun control, and many others. It ties into climate change and health policy, there's no doubt about that, but it's a tangential factor at best even as we're trying to ween ourselves off fossil fuels at a snail's pace. It's an interesting concept, but not one that should be pushed to the forefront of policy initiatives the Left should make after the Republicans are voted out of office. I don't think people are yearning to roam the countryside through private lands when there are plenty of local, state, and national parks that offer trails to hike and hills to climb. Enjoyed your preceding two books and look forward to reading this one. Great to hear about your third book Ken. I just reread your first book again. I read all of your blog posts that made up your second book but looking forward to reading it in a Kindle format. Fantastic! Really looking forward to reading this. @DoubleD - Your comment "In the grand scheme of things that need fixing right now, this seems pretty insignificant" is probably quite a fair assessment, as Ken acknowledges in his article. Yes, there are plenty of national parks to explore. Yet, consider our capacity for self exploration. For most, it erodes over time. We can explain this scientifically - myelin begins to coat the axons in our brain, inhibiting the growth of new branches from the axon. We get stuck in a rut. Creatures of habit. No longer capable of bold and radical thought. When one considers the 'Right to Roam' from this perspective, perhaps such initiatives are infinitely more important than the host of pressing issues that must be resolved. We are faced with immediate problems yes. "universal healthcare, better public schools, gun control". But there will always be problems to solve and challenges to come. Known unknowns (such as the potential dangers of A.I.) and unknown unknowns. Focusing on nurturing free-thinking individuals not constrained by artifical notions is vital if we are to succeed. We need a two pronged approach of solving todays problems whilst ensuring the next generation are equipped to solve the challenges they must meet. I see DoubleD's case as containing a fallacy. The fallacy is that we can do only one thing at a time, and that consequently lesser causes must be subordinated in a hierarchy of causes. Remember when Cecil the lion was killed? There was widespread outrage about the killing of a lion. But many people jumped into the issue with righteous statements that basically went: "How can you be so concerned about the death of a mere lion when [fill in the blank with a greater cause]." In many cases, there were attempts at shaming those who cared about Cecil the lion, as if those who care about lesser causes are somehow morally blind to greater causes. There's a whiff of narcissism, too, when righteous types resent anything that keeps their own cause from being the cause in the spotlight. I would argue that we can do many things at once, effectively and unapologetically. I would further argue that it would be ethically wrong (and strategically foolish) to defer lesser causes until greater causes are resolved (when might that ever happen?). There is a political as well as an ethical argument. The right wing, with their think tanks and their big budgets, from the local to the national level, are pursuing a multi-pronged agenda — all simultaneously. Tax cuts for the rich seems to be the biggest priority, but that doesn't prevent them from attacking voting rights, environmental science, effective regulation, diplomacy-based foreign policy, etc. The right wing also has an extremist view of property rights, which the Right to Roam strongly counters. This is why we call a policy agenda a platform. It's a structure with many parts, all of which matter, all of which we can pursue at the same time. I've been thinking a lot of the word "freedom," and particularly the phrase, "freedom isn't (or ain't) free." It seems strange that we define it by what it isn't, and nobody seems to know what it is. Maybe freedom is just the freedom to walk wherever we want (while respecting the land we walk through). Maybe if we had a right to roam, like we had for the first few hundred thousand years we were around, we could define freedom for what it is, and not what it isn't.